This "study" began as an academic exercise in the saddlemaking program at Spokane Community College by the late Verlane Desgrange and her students. With the closing of the saddlemaking program at Spokane Community College the exercise was not finished. In 2011 ASMA revived the exercise. The purpose here was not to be a definitive study, but an exercise using antidotal evidence and actual data from a random sample of trees from a major tree maker to determine if there was a method or formula that could be used as a guideline or standard industry wide. This exercise is ongoing and as additional data and methods are evaluated the analysis and conclusions arrived at may be modified. 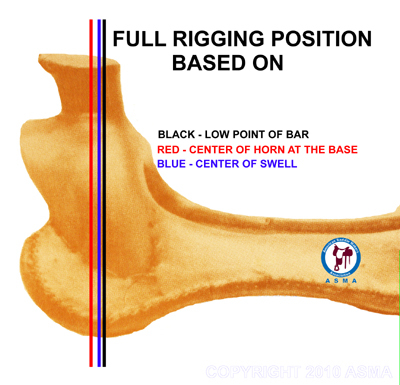 Once the saddle maker has determined what rigging position is appropriate for the saddle he or she is building: The question at hand is; How are the rigging positions on a western saddle determined and is there a formula and/or standard that can be used? 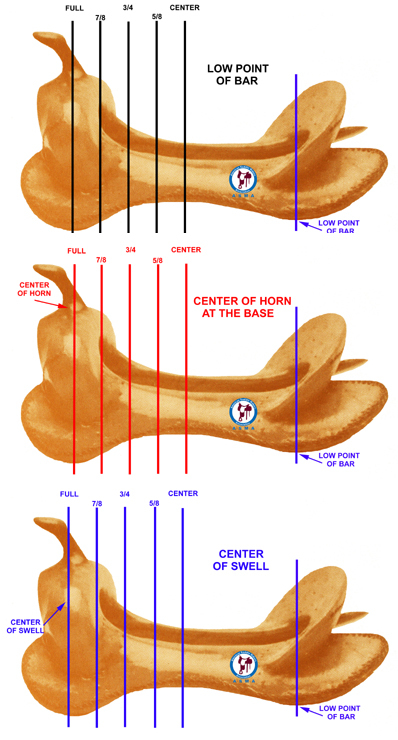 There are 5 basic rigging positions of western saddles. 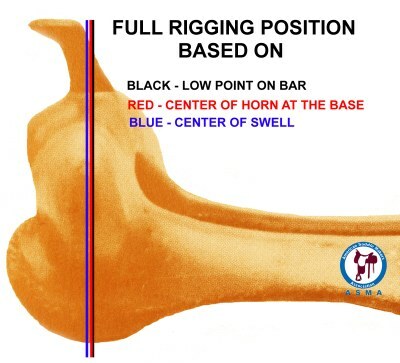 That being said there are two generally accepted basic formulas for determining rigging positions on a western saddle. These formulas have been identified for this study as the ½ Method and the Interval Method . Before either method can be examined, reference points need to be established. The second reference point is determined using two methods. 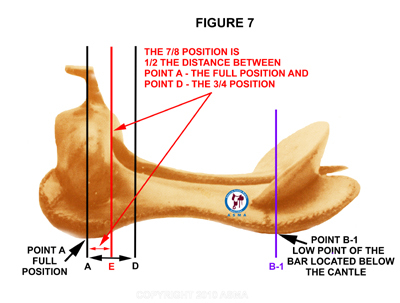 * the point where the cantle meets the bar (See point B in figure 1) . 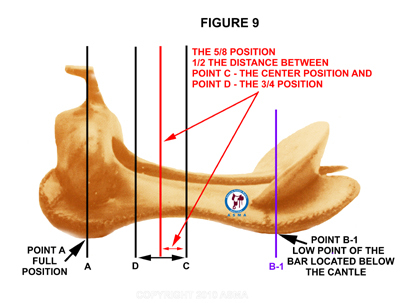 * the low point of the bar located below the cantle (See point B-1 in figure 1). The full position is determined by one of the three methods from above. 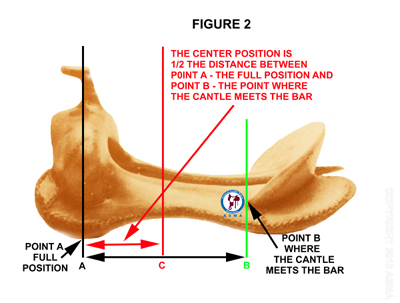 The center position also referred to as Centerfire or California is determined by dividing the distance between the full position (See point A in figure 2) and the point where the cantle meets the bar (See point B in figure 2) or the low point of the bar located below the cantle (See point B-1 in figure 3) by one half. 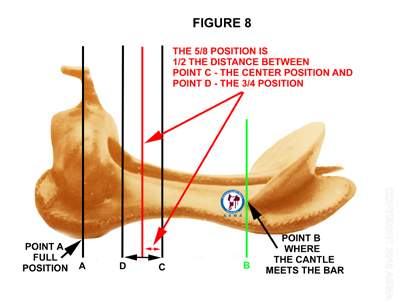 NOTE: in the following illustrations the low point of the bar is used to determine the full position and both the second reference points ( point where the cantle meets the bar and the low point of the bar beneath the cantle) are demonstrated. The 3/4 position also know as Montana is determined by dividing the distance between the full position ( See point A ) and the center position ( See point C ) by one half. The 7/8 position is determined by dividing the distance between the full position (See point A ) and the 3/4 position (See point D ) by one half. The 7/8 position is the predominant rigging position being used currently. The 5/8 position or Arizona is determined by dividing the distance between the center position (See point C ) and the 3/4 position (See point D ) by one half. This formula does not address seat size specially, but the formula takes it into account by way of the two reference points (the full position and the low point of the bar beneath the cantle or the point where the cantle meets the bar) because the seat size is included in the distance between the two reference points. 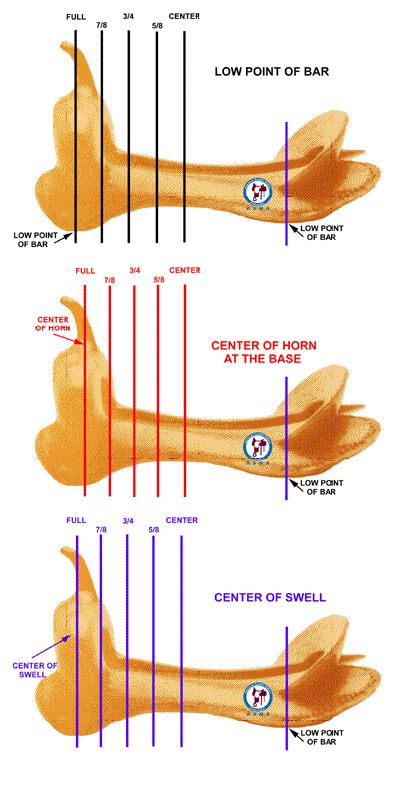 The 3/4 position will shift towards the cantle about 1/2" from a 14" seat to a 16" seat. 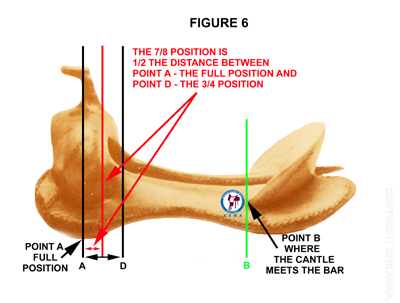 Also, due to the fact that the low point of the bar beneath the cantle is further back from the point where the cantle meets the bar the distance between the positions will be longer. 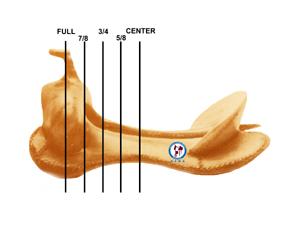 The actual difference on a sample tree is 1 5/8 inches, which would translate to a difference of 7/16 of an inch between the two reference points at the 3/4 position. 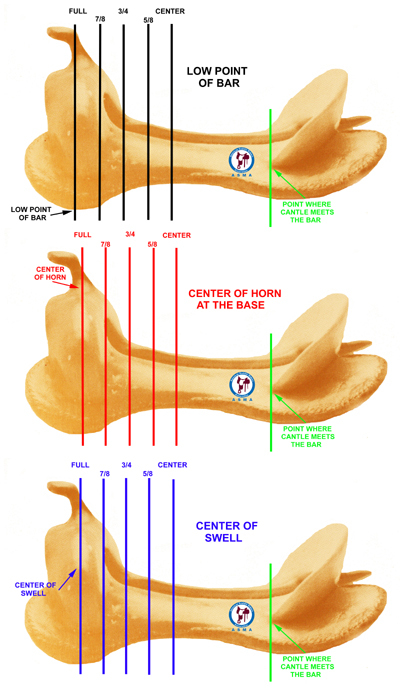 * the center position is (X)" back towards the cantle from the full position. When using this formula the question becomes: How many inches does one use? 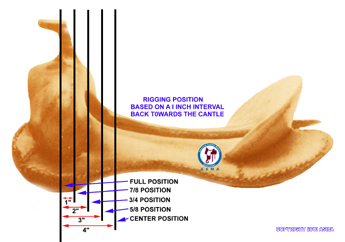 * the center position is 4" back towards the cantle from the full position. Another measurement could be, using half the distance between the center points or slots in the three way rigging plates or dees. Using the most widely used 3-way dees, the measurement is 1 1/2 ". 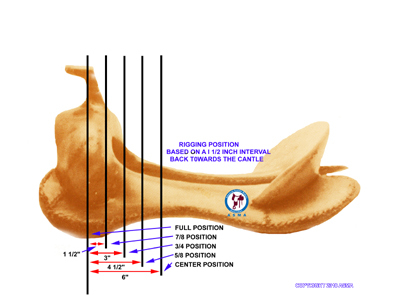 * the center position is 6" back towards the cantle from the full position. This formula’s possible weakness is that it does not take into account the seat size. 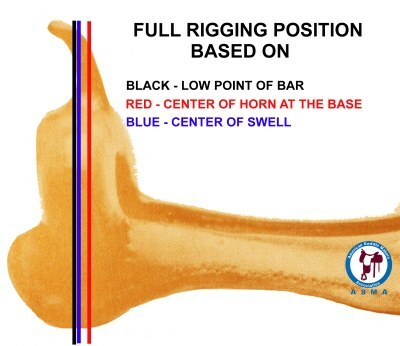 All the rigging positions are the same regardless of seat size. This may or may not be a problem. 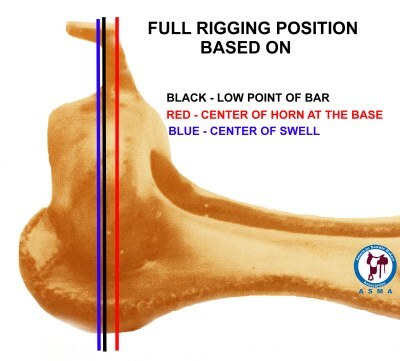 With two basic rigging position formulas and two variations of each formula what is the comparative results. NOTE: For the actual measurements a tree with 15 ½" seat was used. The actual measurements will decrease with a smaller seat and will increase with a larger seat. 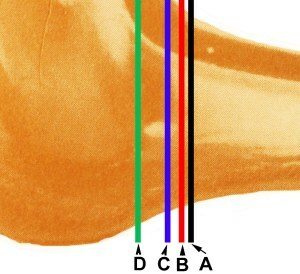 A TO B - 1/8"
A TO C - 7/16"
The actual difference measured on a sample tree is less than 5/8 of an inch between the three formulas. The 1 inch interval is under 3/4 of an inch from the first of the other three formulas on a sample tree. Therefore, one may conclude that either of the ½ METHODS may be used to determine rigging positions. Also, the 1 ½ inch INTERVAL formula can be used as falls between the ½ METHOD positions. * the 1 ½ inch interval ( based in a double dee rig plate ) ( B ) The 1 ½ inch interval formula still has the problem of not accounting for seat size. Note: The 1 ½ inch INTERVAL formula may be considered the default for the INTERVAL method due to the fact that it is the interval used in the 3-way rigging plates. To analyze the reliability and effectiveness of the 5 reference points, 6 tree types were chosen randomly. These trees types are: Association, Buster Welch Cutter, Cliff Wade, Ellensburg, S F Bowman, and T M Roper. Each of the 5 reference points were plotted on the sample trees along with a common reference point (highlighted in red) to test the uniformity of the reference points. These results show that 4 of the trees ( Association,, Ellensburg, S F Bowman, and T M Roper) meet the common reference point while 1 tree ( Cliff Wade) is just short and the other tree ( Buster Welch Cutter ) is short. Further observation reveals that the 4 trees that meet the common reference point have the same bar shape while the other 2 each have a different bar shape. Therefore, while bar shape or pattern is a variable and effects the position of the reference point, trees with the same bar shape should yield the same reference point. This indicates that there is predictable uniformity when then bar is used as the reference point and the bars are the same shape or pattern. The results here indicate that only 1 tree meets the common reference point, with 2 trees just short and one tree just past the common reference point. Therefore, the type of horn and the horn’s position on the swell is a variable and effects the reference point. 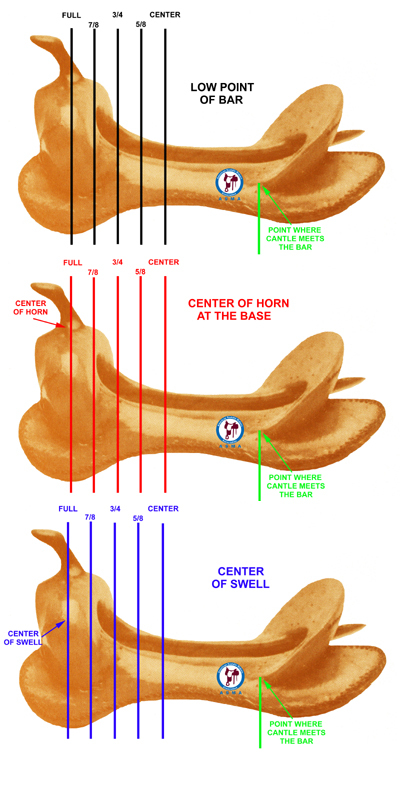 This indicates that for each horn type and each horn placement on the swell a unique reference point will be created. 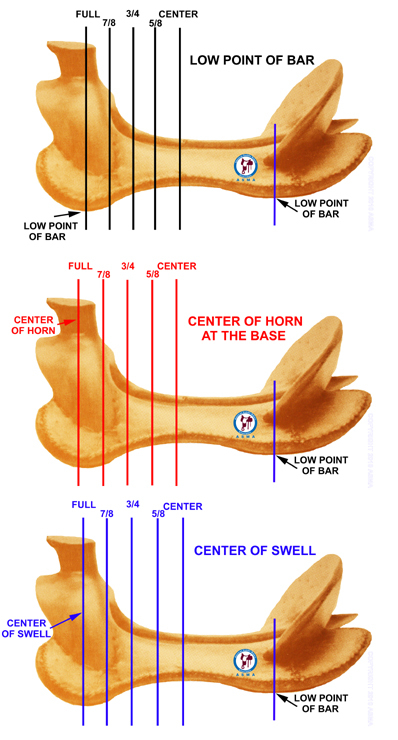 This indicates that for each horn type and each horn placement on the swell a unique reference point will be created with no uniform predictability. Here again the results here indicate that only 1 tree meets the common reference point, but 2 trees are just short of the common reference point and 2 other trees are close. 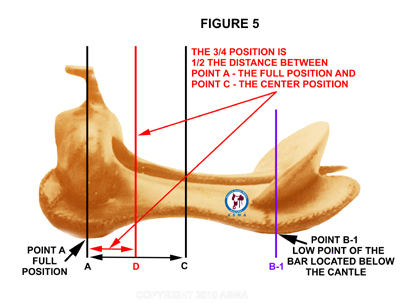 Again, the swell shape and angle is a variable and will effect the reference point and yield a separate reference point giving no uniform results. These results are almost identical to the results of the full position using the bar. Four of the trees ( Association,, Ellensburg, S F Bowman, and T M Roper) meet the common reference point while 2 trees ( Cliff Wade, Buster Welch Cutter ) are short. Again, observation reveals that the 4 trees that meet the common reference point have the same bar shape while the other 2 each have a different bar shape. As with the full position using the low point of the bar, while bar shape or pattern is a variable and effects the position of the reference point, trees with the same bar shape should yield the same reference point. Again, as with the full position using the low point of the bar, there is predictable uniformity when then bar is used as the reference point and the bars are the same shape or pattern. This set of results indicate that 2 trees meet the common reference point, 2 trees are short of the reference point, and 2 trees are long or past the reference point. Given that 4 of the trees have the same bar shape but yield 2 different reference points means that the point where the cantle meets the bar is a variable and will effect the reference point. These results have some uniformity, but they are unpredictable. 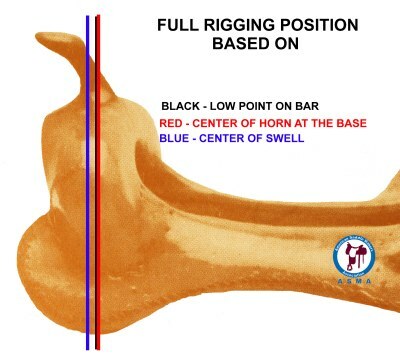 The analysis of the rigging position reference points, indicates that there is not an individual or combination of reference points that can be definitively used to establish rigging positions. Each reference point or combination of reference points has its own set of weaknesses. There is little or no predictability due to the variables that have been mentioned before. 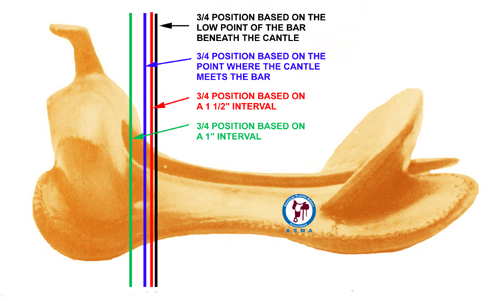 The only reference points that did have some reliability are the reference points based on the tree bar. 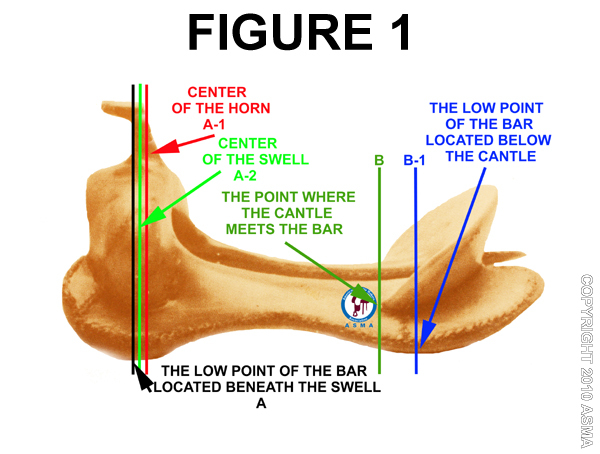 Those being the full position using the low point of the bar and the second reference point using the low point of the bar. As noted in the analysis these reference points only have a uniform predictability when the bar shape and pattern are the same. 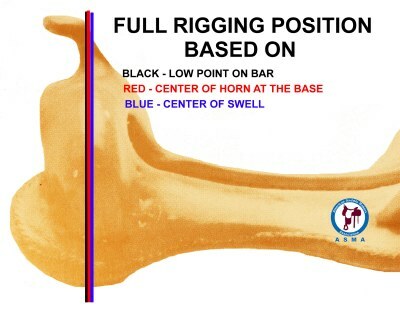 Therefore, it is concluded that there is no formula or method for establishing the rigging positions for a western saddle that can be used as a standard. 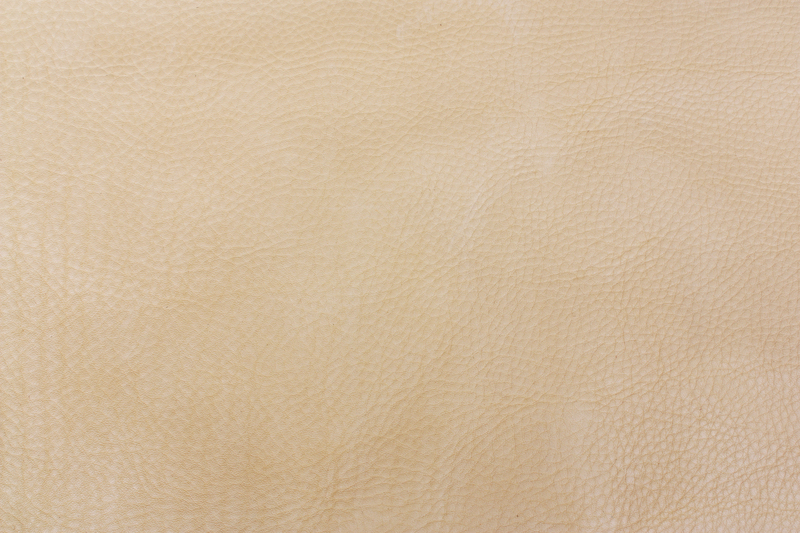 Each saddle maker needs to determine which of the methods suits his or her needs the best. If one could make a recommendation it would be to use the full position and the second reference point that uses the respective low points of the bar. 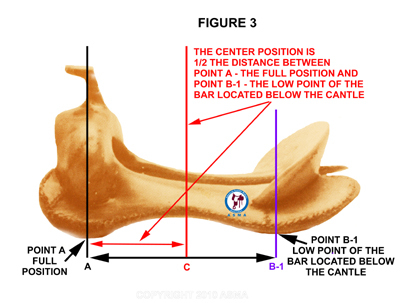 As indicated in the analysis the full position based on the low point of the bar and the second reference point using the low point of the bar beneath the cantle does yield uniform predictability, but only when the shape of the bar is the same. Scroll down or click on tree type for examples. 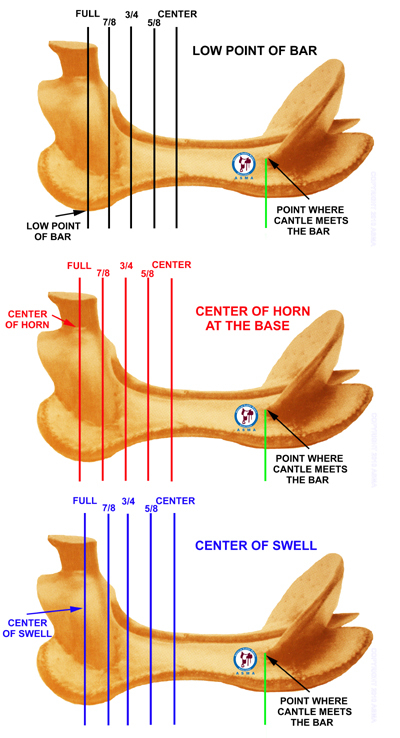 In this example of an Association type tree, the low point of the bar and the center of the horn at the base are almost identical with the center of the horn slightly ahead of the low point of the bar. The center of the swell is just ahead of the other two. All these positions are within about 1/2" of each other. In this example of a Buster Welch Cutter type tree, the low point of the bar and the center of the swell are almost identical with the low point of the bar slightly ahead of the center of the swell. The center of the horn at the base behind the other two. In this example of a Cliff Wade type tree, the low point of the bar and the center of the swell are somewhat close together with the center of the swell slightly ahead of the low point of the bar. 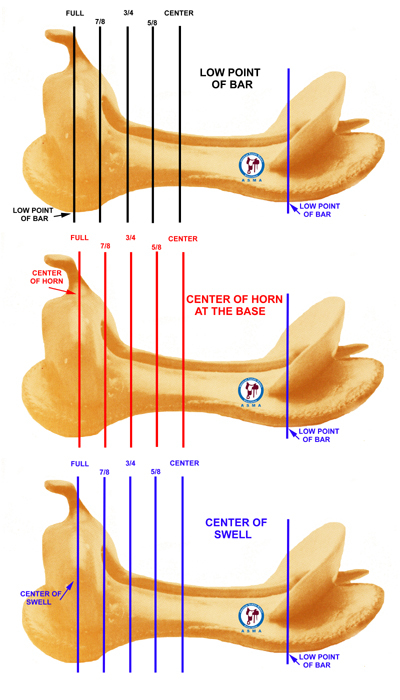 The center of the horn at the base is ahead of the other two. 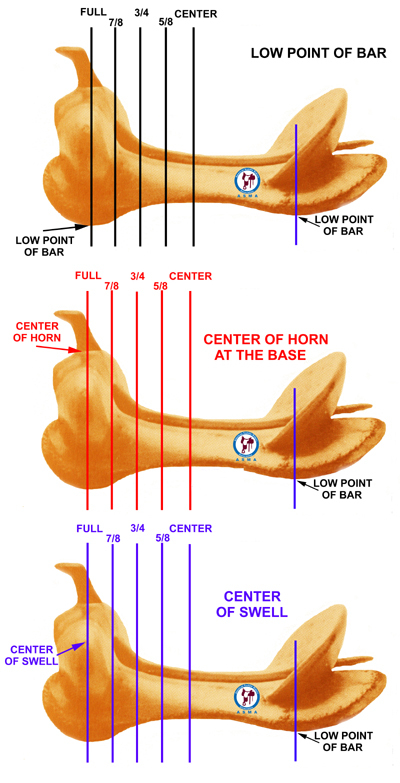 In this example of an Ellensburg type tree, the low point of the bar and the center of the horn at the base are almost identical with the low point of the bar slightly ahead of the center of the horn. The center of the swell is ahead of the other two. In this example of a S F Bowman type tree, all the full position reference points are almost identical. They are within 1/4" of each other. In this example of a TM roper type tree, the low point of the bar and the center of the swell are almost identical with the low point of the bar slightly ahead of the center of the swell. The center of the horn at the base behind the other two.